Wow... Where to start. 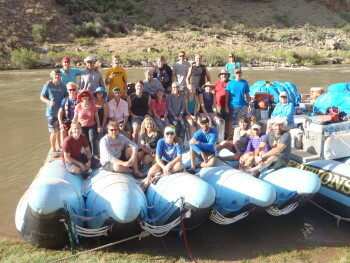 Our family got to take the 6-day Grand Canyon river rafting trip this July. It was amazing and much of it was beyond description. The Geology, the variety, the exhilaration of the rapids, the satisfaction of having a restaurant grade dinner after a full day all contributed to the amazing journey. The fact that my wife, children and in-laws all experienced 180 miles of the most unusual terrain on the planet made this a lifetime adventure. Everyone who is an adventurer and outdoor person should do this. 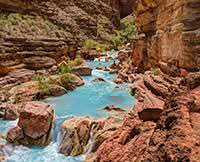 Imagine cruising down a gentle stretch of the river and seeing bighorn sheep playing games on the ridge above you. In addition, the expert guides educated us on much of the canyon history and reasons for the unusual sites we saw. And while we are talking about the guides, these are not college drop outs that were looking for a summer job. These guys were amazing, fun people who went over and beyond to make our trip extraordinary. They help set Western River apart from the other options for taking the trip. In addition, the top notch equipment, the high quality meals (which were tasty and therapeutic after full day that starts at sun-up), and the comradery kept the adventure feeling personal and part of a team experience. You MUST give this a try. Come and try the expedition that rides the river.